What makes the best bait? When choosing bait for estuary fishing (or any other style of angling) you can’t beat the bait you gather yourself. We’re often told that 10 per cent of anglers who go fishing catch 90 per cent of the fish. I reckon you could probably bump that up a bit. Pink nippers or bass yabbies are superb for estuary and inshore angling. I love my lure and fly fishing. There’s something intrinsically rewarding about fooling a fish into eating a chunk of plastic or a pinch of fur and feathers. Perhaps it boils down to our innate need to prove we really are smarter than a glassy-eyed creature with a brain the size of a pea! But I’m also the first to admit that if I were fishing for survival or bragging rights, I’d most likely reach for some natural local bait. Not all baits are created equal. A dubious packet of frozen, thawed and re-frozen prawns from the local servo might do the job at a push, but there are many better options on offer. When it comes to choosing bait, there’s one golden rule to observe above all others: fresh is good and live is better! Taking this a step further, locally sourced baits generally out-perform imported varieties by a significant margin. And by ‘local’ I mean offerings collected or caught right where you intend fishing. That could mean worms or bardi grubs dug from an inland riverbank, pipis (cockles) winkled from the beach sand with your bare feet, or squirt worms sucked from the estuary sand flats. Soaking a fresh bait appeals to anglers of all ages, and bream are a common catch, right around the nation. Note the red plastic bead on the leader, designed to enhance the fish-appeal of the rig. Most smart anglers end up assembling a small arsenal of essential bait-gathering tools. A commercially made bait pump (sometimes referred to as a yabby pump or nipper gun) is vital for anyone fishing in our coastal estuaries and bays. These nifty gizmos consist of a long metal or plastic tube with a handle-activated internal plunger. 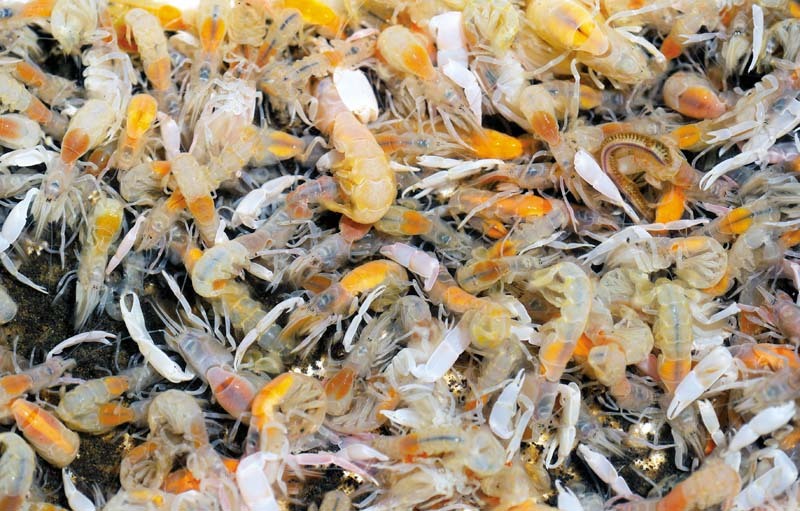 They’re used to pump or blow marine invertebrates such as saltwater yabbies (called pink nippers or bass yabbies in various parts of the country) and various marine worms from the inter-tidal sand or mud flats. Although they take some practice to master using, a cast or throw net can also be a priceless bit of kit for securing small bait fish. Bear in mind that the use of these nets is banned in some states, including NSW and Victoria – check first! Where you’re not allowed to throw a cast net, you may be permitted to deploy a specified number of small baited traps or cages, often referred to as ‘poddy mullet traps’. 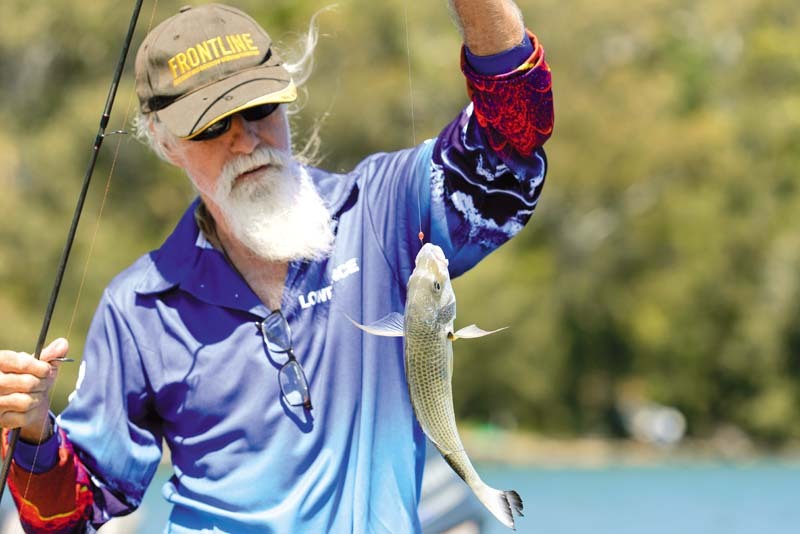 A few light handlines rigged with small split-shot and tiny long-shanked hooks (sizes 10 or 12 are ideal) will prove invaluable for catching mullet, yellowtail scad (yakkas), slimy mackerel, little pike, herring (tommy ruff), garfish and various other small fry that can be recycled as live, dead or cut baits. Again, be sure to check local regulations in force where you’re fishing to find out what – and how many of what size – you can keep. An old knife with a sturdy blade is useful for prying opening mussels, cockles, oysters and other shellfish, as well as for cutting cunjevoi or sea squirts from the ocean rock ledges – where you’re still allowed to do so. The meaty red flesh and soft, squishy organs inside these sea squirts’ leathery cases make brilliant bait for a wide range of inshore species. Bait gathering is easily turned into a fun activity for the whole family. Add a bucket or two for storing and transporting your bait between fishing spots and maybe a little battery-operated aerator pump for keeping small fish and invertebrates alive overnight and you’re in business. If you’re clever, you can make everything in your DIY bait-gathering kit, apart from the yabby pump, fit in one bucket with a lid and carry handle. Catching or gathering bait locally might not be as convenient as buying it from a servo or tackle shop along the road but over the longer run it’ll save you plenty of money and I guarantee it’ll score you more and better fish, wherever you cast a line. Also, don’t be too surprised if the harvesting process becomes a fun family activity in its own right, even over-shadowing the fishing it’s supposed to be supporting! See the full version of this review in Trade-A-Boat #476, April 2016. Why not subscribe today? Can the 'carp virus' finally eradicate carp in Australia?